"If you’re one of the many enterprise (and increasingly, small business) users of Socialtext, you’ll be excited about today’s Socialtext Mobile beta launch news. 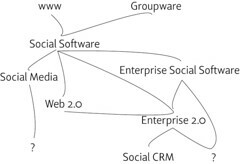 If you’re in the market for an Enterprise 2.0 solution for your business, there’s even more reason to get Socialtext on your roadmap." "Socialtext President and co-founder Ross Mayfield says the mobile version of Socialtext should includes almost all the features found on its downloadable application Socialtext Desktop — namely, you’ll be able to read colleagues’ Twitter-style comments and post your own comments in Socialtext Signals, follow co-workers’ activity streams, view their profiles, and also read and edit content in Socialtext’s wiki workspaces." "Via a Blackberry, iPhone or Android, users can see and post to their company’s Twitter-like message stream and access their company’s Socialtext Workspace, an enterprise-ready wiki. The platform’s SocialCalc collaborative spreadsheet offering is also accessible via the mobile interface." "The lightweight Web app works on Apple's iPhone, Research In Motion BlackBerry smartphones and Android smartphones, allowing users to access Socialtext's Twitter-like Signals microblogging tool and browse through users' activities, content and contacts. Users can then access a contact's virtual business card by clicking to e-mail or call the contact from their smartphone." "Users won't have to do any extra configuration to use the mobile version. Socialtext Mobile automatically detects when you log in from a mobile phone and serves up an optimized mobile application." "Rather than a native application tailored to the iPhone, BlackBerry, or Android, Socialtext chose to create mobile browser version that is cross-platform by default. The site will detect when you're logging on through a mobile device and redirect you to a subdomain with a custom UI, which was built to reflect the desktop version of Socialtext."